SimCity's upcoming expansion should give you the chance to create a utopian paradise, or maybe a dystopian nightmare, if that's more in line with how you see the world. Cities of Tomorrow launches November 12, according to a new blog post by developer Maxis. As you can see in the trailer above, the expansion's content focuses on the choices you can make about clean energy, corporate responsibility, and industrial decay. Want to create William Gibson's Sprawl megalopolis? This expansion might give the keys to re-imagining that particular urban fantasy. Thanks to a preview from IGN , we know that expansion owners can play alongside the standard version of the game. There'll be garbage atomizers, wave-power generators, and magnetic monorail trains, according to the preview. 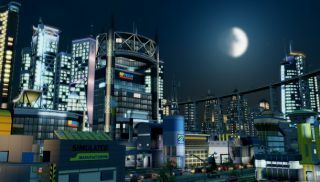 Much of the way the expansion's new additions affect a city will depend on whether or not you side with the game's OmegaCo, a vast and powerful entity that may lead a city more in the direction of "gluttony and consumerism," rather than green technology, according to Maxis. SimCity is obviously trying to moving on from its troubled launch earlier this year. The new expansion looks like it will expand player choice, rather than work to undermine it.